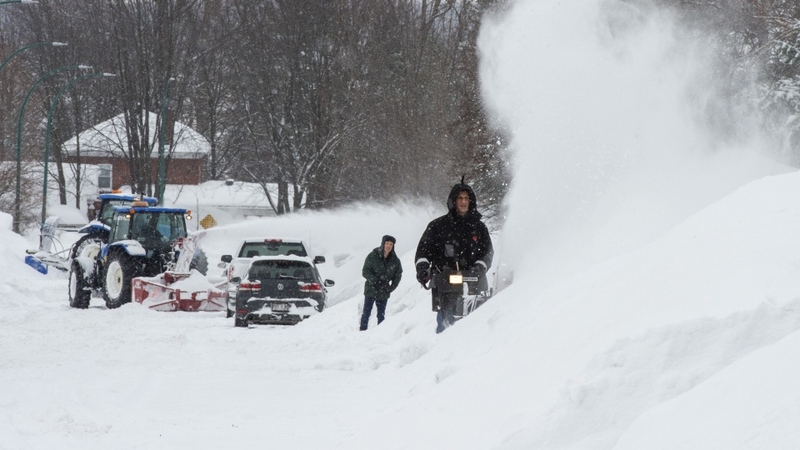 It's the biggest snowfall of the season -- and it's going to take a long time to dig out. Forty centimetres of snow have blanketed the city since flakes began to fall on Tuesday afternoon. Hundreds of schools across the province cancelled classes, including CEGEPs and Universities, because driving is extremely difficult. Even the Carnaval de Quebec has cancelled events for the day. Where streets have been plowed, the drifts are waist-high. Montrealers who parked their cars on the street should expect to have to shovel for quite some time. One woman told CTV News she had been shovelling for 40 minutes and was nowhere near ready to get her car out of a spot. One word of warning: make sure the car's exhaust is cleared before starting the engine. In recent years several people have been hospitalized, and some people have died, because of carbon monoxide poisoning that arose when people were sitting in parked cars with engines running and the tailpipes were covered in snow. Police are also reminding people to clear all the snow off their cars or face fines: up to $200 for windows that are not cleared, and another $100 for having snow on other parts of the car. Now's a great time to commit some good deeds, too: People all over the city were seen helping others shovel their driveways and dig out their cars. Wind gusts will be relatively mild, but the snow is light enough that visibility will be very low. The situation in the Outaouais was to be quite similar, with precipitation easing a little earlier and a total expected accumulation of about 35 centimetres. The forecast is for about 25 cm of snow in the Quebec City region, but it will be windier, with gusts up to 90 km/h possible. The city of Montreal had snow clearing crews out overnight, but even so, only major arteries were relatively clean in the early morning. Smaller streets in many neighbourhoods had been plowed once, or not at all, while countless sidewalks were not plowed overnight. 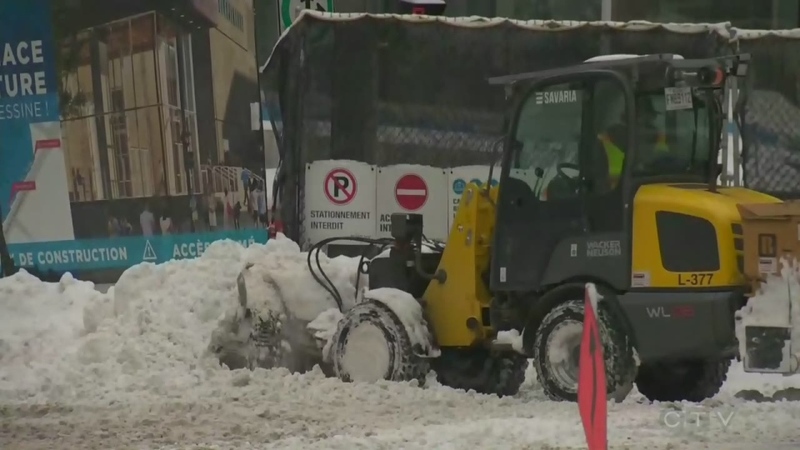 Removing all the snow will likely take more than a week, and city officials said snow clearing operations will start in all boroughs in Montreal on Wednesday evening. Quebec's Minister of Public Security Genevieve Guilbault said Tuesday that the government was taking its responsibilities seriously and that public safety and transportation were "on high alert." 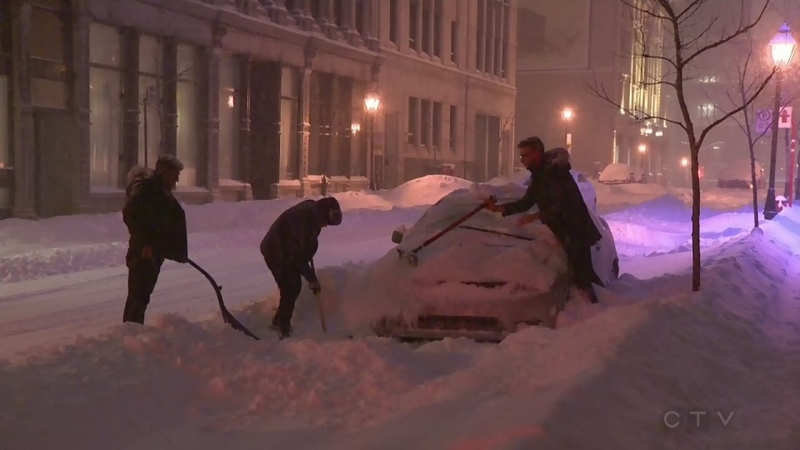 Transport Quebec had 200 people plowing snow in the Montreal area overnight, with another 50 people on patrol. The Ministry reported that the roads were snow-covered and the visibility varied from fair to none on highways 5, 10, 15, 19, 20, 25, 30, 35, 40, 50 and 55 overnight and early Wednesday. The same was true of highways 132 and 138. Later on, Highway 20 east of Exit 314, as well as between Levis and Montmagny, was closed. 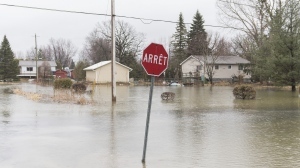 Parts of Highways 40 and 440 in the Quebec City region were also closed. Transportation Minister Francois Bonnardel said conditions were as good as could be expected. "It's not too bad, everything is going well. Some roads were closed because the wind is too strong, but we have surveillance of every road in Quebec," said Bonnardel. "We're evaluating the situation hour by hour." 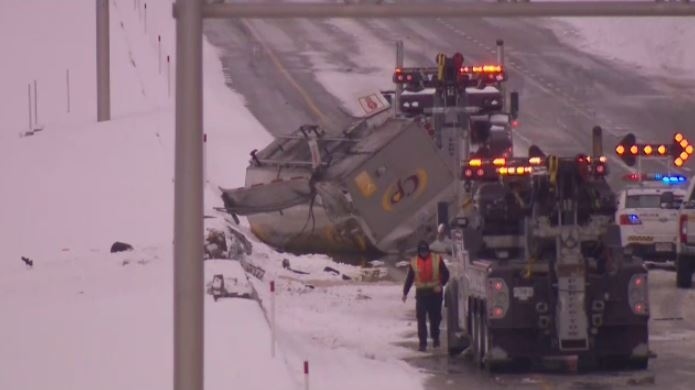 Around 12:30 p.m. Highway 13 north was closed in Laval when a tanker truck flipped onto its side. Police closed the highway at the Samson exit and were diverting all traffic to the service road. The tanker was carrying vegetable oil -- so nothing toxic – but the mess took hours to clean up and the vehicle needed to be towed before the road reopened Wednesday evening. The provincial government is warning drivers to be very cautious and to adapt their driving according to road conditions, and suggested people stay at home unless their trip was essential. Mindful of the fiasco that stranded hundreds of people on Highway 13 two years ago, the Sureté du Quebec increased the number of officers on patrol on highways. However there were no major incidents reported. At Trudeau airport many flights to Ontario and cities in the U.S. were cancelled Tuesday and Wednesday. Via Rail warned that its trains could be delayed because of these winter conditions. Orleans Express cancelled multiple coach buses on Wednesday morning and all trips in Eastern Quebec were cancelled for the rest of the day. STM buses also had plenty of problems dealing with heavy snow. A tanker overturned on Highway 13 in Laval, spilling vegetable oil onto the road. A small snow plow clears snow in Montreal on Feb. 13, 2019.